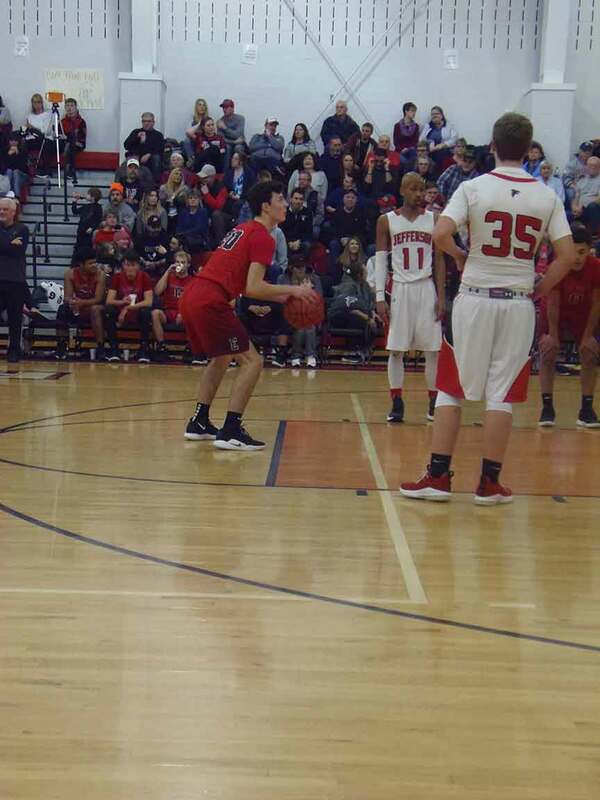 JEFFERSON – The Jefferson Falcons boys basketball team hosted the Edgewood Warriors in a recent Ashtabula County match-up. Edgewood ran away with the game for a 92-46 win. With the win Edgewood improved to 12-0 on the season. Jefferson fell to 0-13 on the year with the loss. The Warriors started the game with a 25-5 lead after one quarter of action. Sam Jerman and Hayden Kanicki each had a big opening quarter for the Warriors in the blow-out win. Both players would score ten points in the first quarter to help Edgewood build a twenty point lead. Jake Zappitell added a three-pointer and Ricky Baldwin chipped in two points. Jefferson was able to get a three-pointer from Colin Priestep and two points from Jake Butler in the first quarter. Edgewood continued their dominance as they outscored Jefferson 21-10 in the second quarter. Aaron Anderson took over the scoring for the Warriors with eight points. Evan-Andre Rapose added five points. Zappitelli, Jerman and Alec Katon also scored in the quarter. Jefferson was able to find the bucket a little bit more with a pair of three pointers from Brandon Strang. Andrew Mehalic added a basket and Tyler Messenger hit a pair of free throws. Edgewood put up twenty-five more points in the third quarter and held the Falcons to 11 points. Hayden Kanicki started to get hot from behind the three-point line with three, three-pointers. Jacob Zappitelli also hit a pair of three-pointers. Aaron Anderson and Ricky Baldwin each added four points, while Sam Jerman added a basket. Colin Priestep hit his second three-pointer of the game for the Falcons in the third quarter. Butler, Brandon Strong and Anthony DiVivo each added a basket. Seve Cantini also hit a pair of free throws in the quarter. Edgewood outpaced Jefferson 21-20 down the stretch for the 92-46 win. Several Warriors players scored in the final quarter including: Trent Johnson, Katon, Jerman, Rapose, Baldwin, Zappitelli and Fernando Cotts-Colon. Bobby Ray led the Falcons with nine points in the fourth quarter. Cameron Hall also came off the bench to score four points for Jefferson. Hayden Kanicki led the Warriors in the win with 19 points. Also scoring in double digits for the Warriors were: Sam Jerman with 17 points, Jacob Zappitelli with 13 points, Aaron Anderson with 12 points and Ricky Baldwin with ten points. Pictured: Jake Zappitelli, of Edgewood, shoots a free throw during a basketball game against Jefferson.